Zack Miller left, Colter Shadowshot, Drake Shadowshot, and Slade Shadowshot man the Lemon Head Lemonade stand which they set up on Main Street in Carbondale June 14. There really was no way to walk past the “Lemon Heads” as they stood at their stand on East Main Street in Carbondale on Saturday afternoon, without stopping for a cold cup of fresh lemonade offered by the group of Carbondale youth. The stand was part of Lemonade Day Roaring Fork Valley, which is run through the Buddy Program of Aspen and in conjunction with national Lemonade Day. The program involves the community in helping to teach youth how to be entrepreneurs and to start, own and operate their own business. More than 400 children from Glenwood Springs to Aspen participated in the event. Elijah Sweeterman, 12, said he wants to be a millionaire. Zack Miller, 9, wants to start his own T-shirt printing business. And both Carbondale boys were learning how to fulfill those dreams through the operation of their “Lemon Heads” lemonade stand. Elijah and Zack were joined by brothers Slade Shadowshot, 7, Drake Shadowshot, 5, and Colter Shadowshot, 3, all of Carbondale, to run the stand, which was located in front of the Carbondale Animal Hospital. They sold their lemonade, which was made from fresh-squeezed lemons, organic sugar and purified water. The lemonades, which sold for $2 for a large and 75 cents for a small, were offered with garnishes of either a strawberry, lime slice or sprig of mint. “This is really, really good lemonade,” said one man, who had come back for seconds. 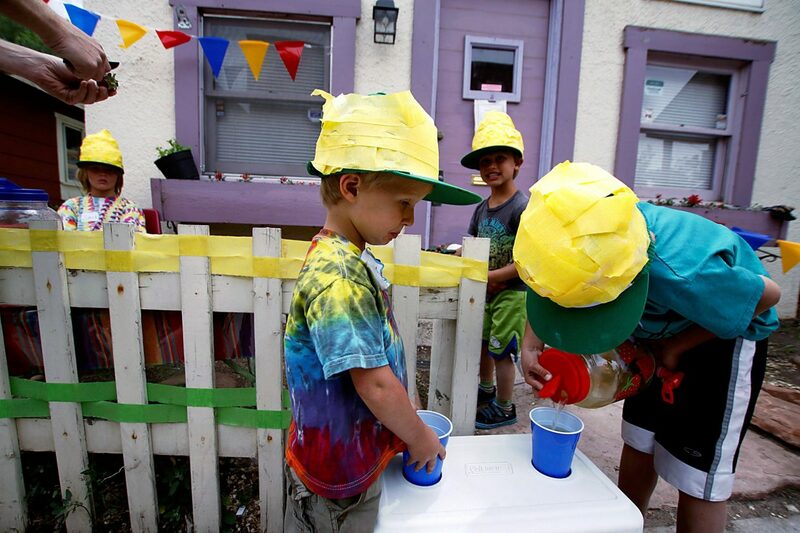 The boys learned all aspects of the business process, from making their signs and their “Lemon Head” hats to squeezing fresh lemons to make the lemonade, promoting and drawing customers to their stand, making sales and counting the money. The “good time” being the counting of the money, of course. “We’ve got $90!” Zack reported to the others at one point. The boys each took turns squeezing the lemons, making the lemonade, getting the ice, selling the lemonade, taking the money and then squeezing more lemons. Colter was the Lemon Head mascot. Miller’s mother, Maureen Miller, said she felt the lesson behind the lemonade stand was important. Lemonade Day is a two-fold program. The first is a month-long learning experience through which the child goes through lessons outlined in a workbook. The second part is the hands-on component of the lemonade stand. The kids are then encouraged to “Spend, Save and Share” the earnings they have made. Alpine Bank is contributing $5 to each savings account opened by a Lemonade Day business. After saving, they’re encouraged to share. So what did the Lemon Heads learn? “I learned how to make lemonade,” Zack said with a wry smile.